We had a pretty ridiculous weekend. 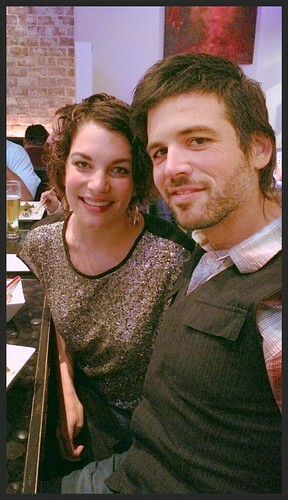 Things got off to a bang with a sushi blowout, continued with an art crawl, and ended up with a trip to the races! The Formula One races in Austin, that is! 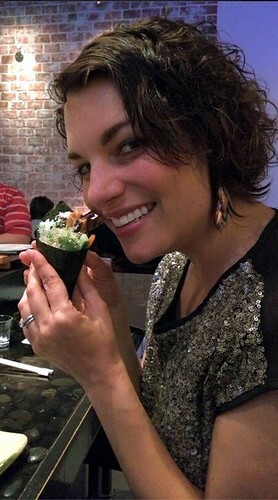 First, though, sushi. I took too many pictures to relegate this to my journal-blog, which you'll find over here. (It's called Classy Otter because reasons.) These pics are all taken with my new phone, so YAY 5s! We hadn't been to Tomo in a while, and I'm not sure why. They just keep on turning out amazing, fresh sushi up on Parmer, and we continue to let them do that without darkening their doorstep. Based on our experience Friday, we should be going much more often (and probably ordering less food, though that's sort of true whenever we go out). Here's Tomo in 2009, the last time I wrote about them. I called on Friday to see if I could make reservations for omakase at the sushi bar and was denied very politely and kindly. It seems they don't take reservations for 2. But then I got a call back that they were running a 3-course lobster special, and if we were willing to reserve one of the lobsters they could accomodate a reservation. Sold! The first lobster course was lobster sashimi. The lobster tail was plunged into cold water until it firmed, and then sliced thinly and topped with a spray of yuzu, a drizzle of olive oil, and a dot of sriracha. Apparently, they still love the sriracha at Tomo Dachi. The second lobster course I forgot to take pictures of, becuase I usually leave these things up to Logan and he declined to be the food paparazzo for the evening. It was the lobster claw and knuckles, sliced and laid atop rice for a nigiri plate. Lovely. Course three was sumptuous but looked hilarious. They took the entire front half of the lobster and mashed it into a miso soup, which became incredibly rich and lobster-y. 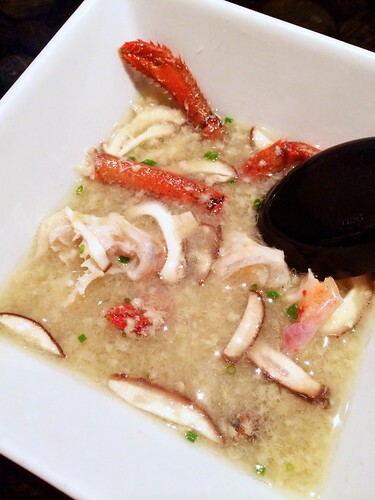 The tiny claws and tentacles sticking out of the broth were a bit unnerving, though, and not edible one bit. I know this because I tried. Our ongoing lobster bacchanalia attracted attention. People around us kept pointing at our plates and muttering, and several asked Lee, our sushi chef, what was going on and how they could order a lobster. They were told you had to be on a list. I didn't have the heart to pipe in "Or just accidentally call on the right day!" We only saw one other lobster go out after ours. 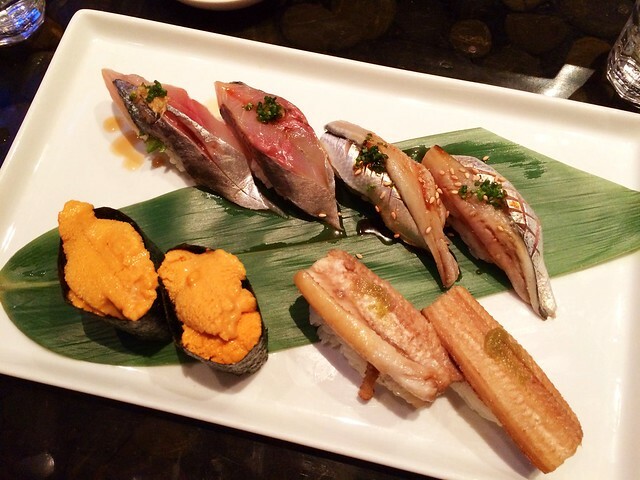 Our omakase didn't end there, though! No! 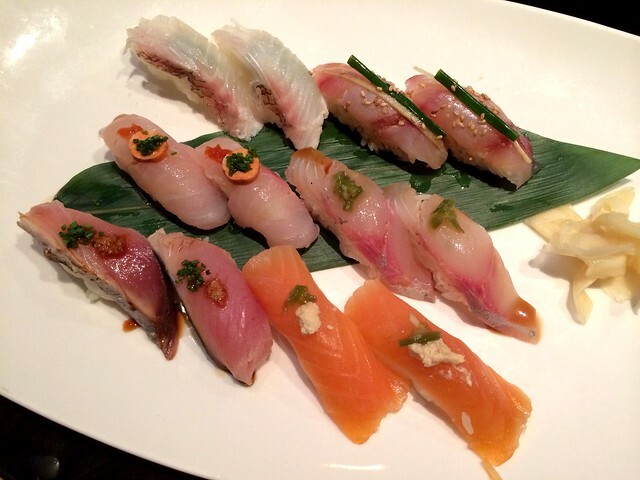 Next we had a platter of nigiri. "Eat it like you read," said Lee. So, top left to bottom right: jap tai (sweet snapper) with shiso, young grouper with hot oil, ginger, and sesame, sea bream with ankimo (monkfish liver), amberjack, bonito, and house-cured salmon with 6-month house-aged tofu. These tended towards the subtle in flavor, with the exception of the salmon. The aged tofu had a definite cheese-like texture and flavor, so along with the cured salmon that bite was happily remeniscent of lox with cream cheese. The jap tai was light, sweet and fresh, and the disk of monkfish liver atop the sea bream melted into a sauce as soon as it hit the tongue. Basically, they were all great in their own way. I love oily fish, so it was difficult for me to choose whether I preferred the kohada (gizzard shad, upper left) or the aji (horse mackerel, upper right). The aji was some of the freshest and meatiest I've ever had; I guess I'd gotten used to it in more downmarket sushi joints, where it's often started to dry out and concentrate in flavor. On the bottom right is anago, salt-water eel; it's served warm and topped with yuzukoshu, which gave it a bright, lightly peppery flavor. Negi toro. 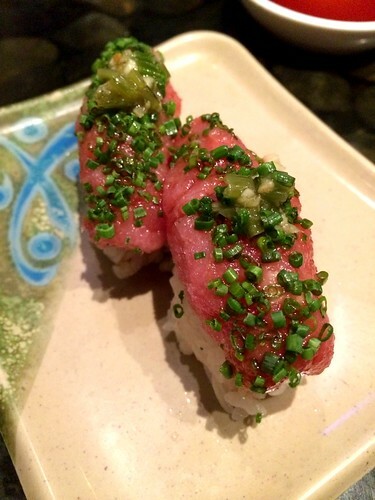 Very finely chopped tuna with thinly sliced green onions and a dab of wasabi. Rich, mouth-filling, incredible. You'd think we'd be done, but I wasn't, quite. I wanted a hand roll, and when Logan mentioned this to Lee, Lee's eyes lit up and he ran to the back. Salmon skin hand roll, to be specific! They use the skin from the house-cured salmon you met above, so this tastes basically like a salmon bacon. It's super-crunchy and just a little fatty and exactly the right amount of salty. Also, when you eat it you feel a little like a squirrel, which is clearly a plus. And then Steve, the owner, made us do a sake bomb. We do not have pictures of that because nobody looks graceful or cool doing a sake bomb. 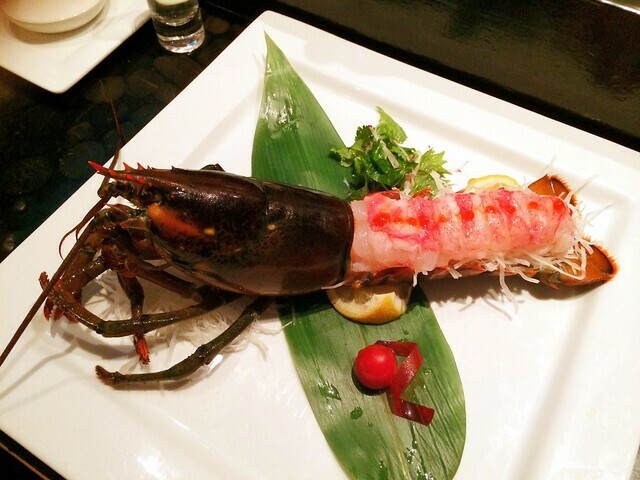 Instead, you get this, which is pre-sake bomb, actually way back peri-lobster. Tomodachi Sushi (aka tomo), if you'd like to go to there, is at 4101 W. Parmer Lane in what feels to me like pretty durn far northwest Austin. You can do omakase, or they have an actual menu full of tasty dishes of varying levels of sushi adventurousness, from cooked mayonnaise-drenched rolls (which I am assured are delicious) up through live octopus. Call (512) 821-9472 to see if they're holding back any lobster you can get in on. Thanks, Tomo! We'll be back, hopefully in less than 4 years!